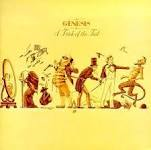 Released in 1976, "A Trick Of The Tail" was the first Genesis album to be recorded without original lead singer Peter Gabriel. At the time of Gabriel's departure, the band held lengthy auditions in the hopes of finding a new vocalist. Eventually it was decided that drummer Phil Collins would take the job. Five years before he would begin a side career as a pop star, Collins asserted himself brilliantly on "A Trick Of The Tail," although keyboardist Tony Banks and bassist/guitarist Mike Rutherford still dominated the songwriting. On full group compositions such as "Dance On A Volcano" and "Los Endos," guitarist Steve Hackett also began to assert himself like never before. Several songs hover around the eight-minute mark, but gone are the 20-minute epics of previous Genesis lore. The Banks/Rutherford ballad/prog mini-epic "Ripples" stands to this day as one of the strongest melodies in the band's history, with Collins turning in a superb, nuanced vocal that was as genuine as anything Gabriel did with the band. Although they were never darlings of the music press, in hindsight it's impossible to overlook how versatile the members of Genesis were. As it turns out, there was life after Gabriel (and before "Sussudio") and "Trick Of The Tail" stands as one of the band's greatest achievements.